Auto Data backup on Cloud = Peace of mind anytime. Maxx Auto Cloud Backup Booster helps you to take auto backup of the databases & files and store them securely in encrypted format over the Maxx Cloud backup server. 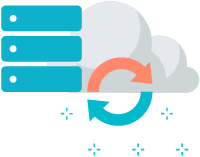 Cloud Backup is also known as online backup where multiple copies of the MaxxERP data and files are stored at the cloud server. MaxxERP takes auto scheduled backup without any user intervention using this tool. Database and files are compressed and encrypted with 30 days backup log that can be identified with its date and and time. Restoring the cloud backup is a very simple one click process where user can choose the available backup among different date logs to restore. Avoid manual efforts of taking regular backups.